London City airport is now updating its 2013 – 2018 Noise Action Plan (NAP). The new plan will cover the next 5 years, 2018 – 2023. The airport has a consultation that runs from 25th July to 5th September. People can comment on the current plan, and say what they think should be changed. The draft plan is at Noise Action Plan 2018-2023. “The main purpose of the NAP is to establish the noise impact of the airport in order to consider whether the current noise management measures are sufficient to protect the local community adequately, particularly those worst affected. In order to demonstrate this LCY’s noise impact has been assessed by qualified independent consultants and is documented in Appendix A.” … The airport has a limit of 120,000 permitted aircraft movements per annum, based upon noise factored aircraft movements. For 2013, London City Airport had a total of 77,377 noise factored movements (based on 73,642 aircraft movements). Annual profits at London City Airport have fallen by more than 10% as the number of flights fell last year. Accounts show a fall in turnover from £113.7m to £112.0m in the year to December 2017. Net profit before tax fell to £35.7m and, following a £2m increased tax charge, profit for the year decreased from £32.0m to £28.5m. The number of passengers fell by 0.3% to 4.5 million, and the number of flights fell by 5.8% to 75,781. About 56% of its passengers are business travellers (compared with 33% at Heathrow), so almost half are on leisure trips. The airport is developing so it can handle up to 6.5 million passenger per year, with up to 111,000 annual flights – a massive increase on today’s number, and inappropriate in such a built up area. First proposed in 1981, commercial flights started at London City in 1987. It was sold to a consortium including insurance giant AIG and Global Infrastructure Partners in 2006. London City was then bought in 2016 by a quartet of infrastructure investors: OMERS, Ontario Teachers’ Pension Plan, Wren House Infrastructure Management and Alberta Investment Management Corporation. Campaigners at local group HACAN East want London City airport to stop growing, cap the number of annual flights & end concentrated flight paths, to protect residents from the noise and the pollution. Today was London City Airport’s 30th birthday. Campaigners – dressed up as bakers – presented the airport will a beautiful cake. They say that now it is 30 years old, it should CLEAN UP ITS ACT. The campaign wants London City to be a better neighbour – the airport is in a totally inappropriate location, surrounded by such densely populated areas that are home to so many people. The airport should NOT be allowed to grow further, as it affects too many people. There is a moving film, with people affected by the airport speaking out. One lady says: “We have lived in our house in Mottingham, SE 9, for over 35 years, Then last year without any consultation or warning we suddenly found we had low flying, noisy planes coming over our house from early morning till late at nights. These flights are devastating to me. I sometimes hate living in my house and I want to move. But the thought of moving away from family and friends at this stage in our life is just too hard to do.” A sad reflection on how aviation impacts people’s lives. One joint venture and two individual contractors are left in the race for the £50m contract to build a 7.5 ha concrete deck at City Airport. Bam Nuttall, Vinci and a joint venture between Graham and Lagan Construction Group are the three bidders left competing to build the deck for the airport next to the King George V dock. The winning team will install 1,000 piles to depths of more than 20 m in length to support massive concrete beams, as part of the east London airport’s £350m expansion. Procurement for the contract was launched last October following the transport secretary Chris Grayling’s decision to give the green light for the expansion in July. The original procurement documents estimated that work would have begun at the end of March, but this has been pushed back. The work will be the first significant piece of construction work as part of the expansion programme. Mr Grayling, along with the chancellor Philip Hammond and communities secretary Sajid Javid, gave the go-ahead last July after years of delays in getting the project off the ground. In March 2015, the then mayor of London Boris Johnson refused to grant the project a compulsory purchase order saying the development of the airport would “blight the lives of thousands of people”. Less than a week after being elected London mayor in May 2016, Sadiq Khan dropped the Greater London Authority’s objection to the CPO, paving the way for the government to give the expansion the go-ahead. Lagan Construction Group has previously worked at City Airport, having scooped the multi-million-pound contract to overlay the existing runway and widen the airports taxiways March 2016. In July 2014 a Graham / Lagan Construction Group JV was awarded the contract to carry out the construction Hull’s £100m Green Port on the Alexandra Dock. Recent airport jobs for Bam Nuttall and Vinci include both firms securing places on Gatwick’s £750m construction framework, with Bam Nuttall securing a place in the civils lot and Vinci landing a spot in the buildings lot. A complaint was made (it is not clear by whom) against an advert by London City Airport in June 2016. The advert stated that “Business or pleasure, time is on your side when you fly from London City Airport … Fly with British Airways or Flybe from Edinburgh, or from Glasgow with British Airways, to the only airport actually located in the city of London….” etc. The complaint was its claim that London City is the only airport in the city of London. It is, of course, not in the square mile of the City of London. The ASA accepted that “the city of London” was intended to refer to inner London, as opposed to the “square mile” City of London. City airport has an E16 postcode, which Heathrow has a TW6 postcode. The ASA said the primary message of the ad was the time that could be saved by flying from or to London City Airport, which they accepted. They therefore said the ad would not mislead, dismissed the complaint, and it was not in breach of advertising codes. Many airports call themselves “London” airports, regardless of the length of journey to get to them from central London. Nine Black Lives Matter activists who staged a protest that blocked the runway at City Airport for 6 hours on 6th September have been given conditional discharges. The protesters got access to the runway, by crossing the Royal Dock on inflatable rafts and climbing up steps. They set up a tripod, locking themselves onto it with arm locks. Some 131 flights were delayed or cancelled, some were diverted to Southend and Gatwick. At Westminster magistrates court the nine activists all pleaded guilty to aggravated trespass with intent to obstruct a person engaged in lawful activity. A second charge of aggravated trespass and an allegation of being unlawfully airside within a restricted area of an aerodrome were dropped by the prosecution. Mike Schwartz, representing some of the group, spent several minutes explaining to Judge Elizabeth Roscoe the reasons for the protest. The Judge said the protest appeared to have “mixed motivations” as she imposed 18-month conditional discharges on seven of the group, and longer terms for two with previous convictions. All have to pay £95 each. She said: “It’s quite clear this caused a lot of disruption to a great many people, doubtless many of whom were the people you were aiming at.” She said it was obvious the protesters had deeply-held beliefs, especially about climate change, but added that she could not see the link to the Black Lives Matter movement. Flights at London City Airport were disrupted this morning after a group of protesters occupied the runway. Earlier reports said they were from Plane Stupid, but later reports say they are in support of “Black Lives Matter”. Police were called to the airport at 5.40am to reports of demonstrators getting onto the runway. They got to the runway by using a small rubber dinghy to get across the Royal Docks. A statement released by the group said: “This morning activists in support of Black Lives Matter UK shutdown London City Airport… This action was taken in order to highlight the UK’s environmental impact on the lives of black people locally and globally. As the largest per capita contributor to global temperature change and yet among the least vulnerable to its deadly effects, the UK leads in ensuring that our climate crisis is a racist crisis.” The protesters were chained together, as the Plane Stupid group were in their protest occupation of the runway at Heathrow (13th July 2015). All flights due to land at London City airport were diverted to Southend and Gatwick airports. The runway was closed for around 6 hours, and a number of passengers had inconvenient delays to their travel. All 9 protesters were arrested and held in police custody. Black Lives Matter have carried out other protests recently. Secretary of State will decide on expansion of London City Airport on or before 28th Sept 2016, on the outcome of the public inquiry, held in April and May. John Stewart and Rob Barnstone from HACAN East at London City Airport had a 2 hour meeting with the five members of the CAA, to discuss the new concentrated flight paths-causing intensified noise. The CAA is aware of the unhappiness amongst communities and local authorities at their decision to allow flight path changes in February 2016. One of the most unpopular changes is concentration of the departures route, in westerly winds, that takes off towards the west and turns north and east. The other change is for arrivals, in easterly winds, when planes approach from east, south of the airport. Most of these communities are also overflown by Heathrow planes on the days there is a westerly wind. Both these have led to intensified noise for thousands of people. London City Airport had argued that they could get away with minimal consultation on these changes because the changes were “not significant.” However, there has been a definite change since February. HACAN East pointed out that the CAA that there was no mechanism to look at changes over time. There were many many changes made in 2008 when the flight paths were changed to accommodate the larger planes which needed to make a much wider turn. HACAN East stressed that respite was important to local communities. People are encouraged to contact the CAA and the airport, to express their views on the noise issue. Sadiq Khan, the new Mayor of London, in one of his very first acts, has instructed the Greater London Assembly’s GLA Land to withdraw its objection to London City Airport’s Compulsory Purchase Order (CPO) of Royal Docks Land, following ‘new’ evidence supplied by the Airport. However, a final decision on the airport’s expansion is not in the Mayor’s hands. The decision rests with the Planning Inspector, who will make a recommendation to both Transport Secretary Patrick McLoughlin and Communities Secretary Greg Clark, following the main planning inquiry into expansion of City Airport that concluded on 5th April. A decision is not expected till the summer. The airport wants to CPO 26.4 hectares of GLA land to facilitate their CADP1 expansion programme which includes parts of the London Plan protected Blue Ribbon Network. of waterways and bodies of water. GLA Land was one of four remaining objectors to the expansion plans. However, its change of heart is not critical. The current Inquiry into the CPO has been adjourned until Tuesday 17 May as negotiations between the airport and the DLR continue, with agreement considered likely. The previous Mayor, Boris Johnson, refused permission for expansion on noise grounds. Within the first few days as London Mayor, Sadiq Khan has re-opened the possibility of expansion at London City Airport. He has dropped the GLA objection to a compulsory purchase order of 26.4 hectares in the Docklands, owned by City Hall. The airport will get the result of its recent appeal against refusal of expansion plans, by Boris Johnson, later this year. The GLA said: “The Mayor continues to support the case for improved noise mitigation measures that will be considered by the Secretary of State when he decides on the planning appeal in due course.” Khan had said in November 2015, during his election campaign, that he would look again at the prospect of the airport expanding. Boris had rejected it, on noise grounds. Meanwhile the owners of London City Airport paid themselves a £27.7m dividend payout last year after the airport attracted its highest ever number of passengers, increasing profits by almost 20%. The airport, while being considered to have the largest proportion of business passengers, in increasingly for leisure trips. London City’s higher customer numbers last year were in part driven by its new travel routes including Berne, Hamburg, Mykonos and Santorini (all just holiday destinations) and extra flights to Edinburgh, Luxenbourg, Geneva and Guernsey. Willie Walsh, Chief Executive of IAG, owner of British Airways has issued a further warning to the new owners (a Canadian consortium) of London City that moves to raise landing charges for the airlines operating form the airport will be resisted. He said: “The airport is good, there’s good demand for it, but the off peak demand is very price sensitive and there’s no way you can serve that sort of demand if it’s very expensive to operate from there.” BA currently has about 40% of the flights at London City airport. Walsh said: “They paid a high price. It’s a good airport, but it’s as expensive as Heathrow in terms of passenger charges. The reason it has grown so strongly is because of us. We are the number one operator from there. We have 18 aircraft there. It’s principally a leisure airport, but there’s only so much you can do for leisure flights. We’d have no problem moving away from London City. There’s no way we’re going to be held hostage there and if the charges go up we’ll move the aircraft. That’s the great thing about aircraft – they’re portable, you can take them somewhere else.” Walsh said earlier that the £2 billion price would mean a multiple of 44 times London City’s earnings (EBITDA), though the airport said it was a multiple of 28. On the last day of the Public Inquiry into London City Airport’s expansion plan, local residents group HACAN East won an important concession, requiring Newham Council to hold a council meeting each year to explain how it is overseeing City Airport’s commitment to provide sound insulation for local residents, if the plans are approved. John Stewart, Chair of HACAN East, said: ”This is an important concession. In the past, Newham Council has not ensured that City Airport fulfilled all its promises to provide agreed insulation for local people.” The Inquiry closed on 5 April and the result is expected to be known in the summer. The Planning Inspector will make a recommendation to the Government, who will make a final decision to either grant or refuse permission for the Airport to expand. If City Airport is allowed to expand, it will build a new taxiway to allow larger planes to use the airport. HACAN East is opposed to the expansion, but welcomed the decision that, if approval is granted, Newham Council will be held publicly accountable for enforcing City Airports commitments to provide better sound insulation for residents. Local resident-led group HACAN East has launched a crowdfunding campaign to fight the new, concentrated flight paths for planes to and from London City Airport. HACAN East is seeking to raise £25,000, in order to campaign to reverse these changes – which they describe as Noise Ghettos – within 12 months, when the CAA will review airspace changes. In February, new concentrated flight paths began operating over many parts of east & south-east London, leaving parts of many boroughs with levels of aircraft noise not previously experienced. HACAN East know that taking on the might of the aviation industry is not easy. It is only by the local community coming together that residents can win, to get the flight paths changed – and the noise reduced. People in the noise affected areas feel these “noise ghettos” are completely unacceptable. City Airport did not consult residents about the flight path changes. The levels of aircraft noise and pollution have increased to unacceptable levels – reducing people’s quality of life. At busy time of the day, planes can be coming over one every minute or so. They also suffer from Heathrow flights. Crowdfunding details here, if you are able to help. Could Hong Kong billionaire Li Ka-Shing buy London City Airport in £2bn deal? Asia’s richest man and Hong King billionaire Li Ka-Shing is rumoured to be interested in buying London City Airport for £2bn. The airport is owned by Global Infrastructure Partners, and was put up for sale at the end of last year. Credit Suisse has been hired to facilitate the sale of the airport. London City Airport had over 4.3 million passengers in 2015, an 18.38% increase on 2014, to set a new passenger number record. The airport’s most popular destinations were Edinburgh, Amsterdam, Dublin, Zurich, and Rotterdam. On 4th February, NATS implemented the first phase of its LAMP (London Airspace Management Programme). It says this was approved by the CAA in November 2015. It means that routes into and out of London City airport will be altered, and routes will be concentrated – using PR-NAV (precision navigation). The changes involve use of a “point merge” system for arrivals, with the joining points to the ILS out at sea. They will mean all the planes from Westerly departures will be routed over for Bow, Leyton, Leytonstone, Wanstead, Redbridge, Barkingside, Collier Row and Harold Hill. For Easterly departures, all the planes will be routed over Barking Riverside, Dagenham, Elm park and Hornchurch. And for Easterly arrivals, all the planes will be routed over Bexley, Sidcup, New Eltham, Mottingham, Catford, Dulwich Village, Herne Hill, Brixton, Stockwell and Vauxhall. The changes are described by NATS in glowing terms – about “more efficient flights, saving fuel and reducing CO2 emissions, reducing noise, keeping aircraft higher for longer and minimising areas regularly overflown.” And, of course, enabling more flights to be crammed into crowded airspace – to enable the aviation industry to increase the number of flights. HACAN East is talking to its lawyers about a JR against the CAA for failure to consult. The sale of London City Airport could be in jeopardy after British Airways, the largest airline based there (40% of the flights), threatened to pull out most of its aircraft. The second largest airline there has about 20% of the flights. The airport was put up for sale by GIP in in August 2015. BA fears that the high price of £2 billion could force its new owners to raise landing fees, and BA says it is not prepared to pay. Willie Walsh said the £2 billion price would mean a multiple of 44 times London City’s earnings (EBITDA), though the airport said it was a multiple of 28. Walsh said the airport had “very high” airport charges of £19 per passenger, one of the most expensive after Heathrow, and with higher charges he would not make enough profit. The number of passengers at London City airport has grown from 2m in 2005 to an estimated 4.3m in 2015. The airport’s value could also be limited by its battle to get planning permission for a £200m development that would increase the number of passengers to 6m by 2023. The plans were blocked last year by Boris, over aircraft noise concerns. London City is appealing against this. The introduction of Crossrail in 2018, which will cut down the journey time from Canary Wharf to Heathrow, could be a real threat to the airport. The idea of closing London City Airport and using the huge amount of land it takes up for more intensive, and useful, purposes is not new. A report was produced in April 2014 by NEF, setting out very persuasive reasons why this is not a crazy idea. Now Sian Berry, the Green Party Mayoral Candidate, has again suggested this. The plan she proposes is for the site, which is currently up for sale, into a new quarter for homes, businesses and innovative industries. The Greens propose a consortium with City Hall, councils, business and academia to buy the airport. They are urging potential purchasers to look seriously at the compelling business case for changing the use of the site. The land taken up by the airport, and land around it which is in the Public Safety Zone (for crash risk) and so cannot be used, could create far more economic activity, and far more jobs. This might amount to some 16,000 more jobs than the airport provides and add an additional £400 million to the UK’s economy. The land is in a key geographical location, and would be easy to link to transport networks. It could create thousands of new homes within easy reach of central London, helping to ease the housing crisis. As a writer from Estates Gazette says: “London is crying out for more big sites like this where mixed-use schemes can be built.” The site is wasted as a small airport – especially when Crossrail makes the trip from the Docklands area to Heathrow easy and fast. Many residents in East London are in despair following the CAA announcement that it will allow London City Airport to concentrate its flight paths. Campaign group HACAN East is considering legal action against the CAA. Departure routes will be concentrated over places like Bow, parts of Leyton, Leytonstone, Wanstead, Dagenham and parts of Havering. Areas of South London will also experience more concentrated routes. The decision follows uproar at the lack of consultation on the proposals last year. City Airport just put a technical document on its website and informed the Consultative Committee. It was left to HACAN East to hold public meetings in the areas which would be affected. The airport argued it only had to carry out a minimal consultation. Local people, backed by many local authorities, MPs and members of the GLA, said that a full consultation should have been carried out as some areas would get 30% more planes than now. The CAA was inundated with letters calling for a fresh consultation, but the new announcement means it has ruled this out. For those who barely had planes over them in recent years, facing living under a concentrated flight path indefinitely is a miserable prospect. The CAA is not fit for purpose, and being funded largely by the airlines, it should not make these decisions. Labour mayoral candidate – and former transport minister – Sadiq Khan has said that he would consider allowing the expansion of London City Airport if he took over at City Hall. The City Airport Development Programme would lift the ceiling on the number of flights from 70,000 to 111,000 a year, doubling the number of passengers by 2023 a year, as well as make major adaptations to the airport to extend the terminal and build a parallel taxi lane. The changes, the airport says, are necessary to accommodate a new generation of aircraft which is more fuel efficient and will add £750million a year to the economy. The airport, which predominantly serves Canary Wharf and the City, is currently accepting bids to buy the business from its US owners which could generate £2billion. Mr Khan, who has previously come out against Heathrow expansion, worried about air quality, said that the Docklands hub was a special case because of its size and economic impact. He said: “When you look at what London City Airport is doing for the local community, the jobs they’re creating, but also the jobs they’re creating around London I think what you can’t do is play politics with decisions about people’s jobs and business. “City Airport is very small in comparison to major airports like Heathrow and Gatwick and would remain so even after this expansion. His view is in contrast to that of his main rival for City Hall. Conservative candidate and environmental campaigner Zac Goldsmith said he was “very strongly inclined” to follow the Johnson line. London City Airport is appealing against the overrule and Mayor Boris Johnson has set aside £525,000 to defend his decision. The appeal will be heard in March. Comment from Twitter: “Sadiq will protect rich West London but damn poor East London to a noise ghetto hell. A Canadian pension fund that co-owns the Channel Tunnel rail link has joined forces with the German insurer behind the Thames Tideway Tunnel (super sewer) project to enter the £2 billion bidding war for London City Airport. GIP announced at the start of August that it is selling. Borealis Infrastructure, which manages investments for the Ontario Municipal Employees Retirement System, is understood to have teamed up with Germany’s Allianz to make a consortium approach. They are rivals to buy the airport, including another Canadian investment giant, Ontario Teachers’ Pension Plan (OTPP), which has partnered with the sovereign wealth fund of Kuwait and Hermes to submit an offer for the airport. Australia’s Macquarie is also thought to be considering a consortium bid. Borealis and Allianz are already large investors in British infrastructure, and they have worked together on transactions, including a huge deal to buy RWE’s Czech gas pipeline business and the company that owns German motorway services. Some bankers reckon £2 bn is a top-end valuation for the airport but feasible given the current frothy nature of the market for infrastructure assets. The sovereign wealth fund of Kuwait is teaming up with Ontario Teachers’ Pension Plan and Hermes to bid for London City airport, while Macquarie is leading a rival consortium. The airport has been valued at £2 billion. Wren House Infrastructure Management is a massive sovereign wealth fund, one of the world’s largest, owned by the Kuwait Investment Authority (KIA). The KIA is the world’s fifth largest sovereign wealth fund with some $592bn in assets. The current owners of 75% London City Airport, GIP, hired Credit Suisse to handle the sale. Oaktree Capital owns the remaining 25% of the airport, and has agreed to the sale. London-based Wren House was set up in 2013 to facilitate direct infrastructure investment by Kuwait’s sovereign wealth fund. The Ontario Teachers’ Pension Fund already owns Bristol airport (bought Sept 2014 from Macquarie) and holds a stake in Birmingham Airport, as well as other non-airport assets. Despite growth in passengers at London City airports, the sale is likely to be complicated by uncertainty over its £200m planned expansion. GIP to put London City airport up for sale this year – might raise £2 billion? London City airport is to be put up for sale by GIP by the end of the year, who want to capitalise on the rising global demand for air travel. GIP owns 75%, with Oaktree Capital owning the remainder, but both have agreed to the sale. GIP also has the main stake in Gatwick airport, and Edinburgh but say they are not selling these now. It is thought the airport might fetch as much as £2bn, which the FT says would be a multiple of over 60 times the company’s EBITDA in 2014. GIP bought the airport for about £750m in 2006 from Dermot Desmond; he had paid £23.5m for it in 1995 from Mowlem. The airport is trying to get planning consent for work to increase the annual number of passengers to 6 million per year by 2023, (4.1 million in 2014) but this has been blocked by Boris, due to noise. London City is appealing against this and may hear the outcome next year. City airport has already been granted permission to increase ATMs from 70,000 to 120,000 per year. It is widely believed that GIP would sell Gatwick soon, after the government makes a decision on if/where there might be a new runway. Last month, GIP said it would be prepared to give a legally binding promise that it will not sell out for a quick profit if the government decides to opt for a runway at Gatwick. Boris Johnson blocked London City Airport’s expansion plans in late March, as he said it would create a “noise ghetto” for people living under the flight path. Now, as expected, London City Airport has appealed to the Secretary of State for Communities and Local Government, Greg Clark, against the decision. On March 26th Boris ordered Newham council to reject the plans on the grounds of noise disturbance and because the airport was intended for business rather than leisure. Under the plans, take-offs and landings were expected to increase from 70,000 a year to 111,000,with passenger numbers doubling to 6 million by 2023. It would also be able to accommodate larger planes, (and be more profitable). This coupled with the airport’s plans to use new PBN technology to create a much narrower and concentrated flight corridor over Wanstead, Leytonstone and Leyton had prompted fears that noise could become an issue. The airport says it is appealing because of the jobs it creates, and its economic impact. The decision by Greg Clark could take 5 months. On Saturday 25th April there was a local celebration party for people living in the Royal Docks area, close to London City Airport. They held their party to celebrate the fact that the London Mayor Boris Johnson had overturned Newham Council’s decision to grant permission for London City airport to expand. Local children have formed a lively choir, and they entertained the assembled guests. People who suffer from the noise from the airport are delighted that Boris has helped them, and opposed the airport’s environmentally-destructive plans that have been backed by the (Labour) Newham council. Though Newham argues that the airport would bring jobs for local people and local economic benefits, it actually provides little of either. No more than about 500 Newham residents are employed directly by the airport. The business passengers don’t linger round the airport, but head off to business meetings in the City or the West End. It was clear at Saturday’s event that the local community regards the airport on their doorstep not as a benefit but as problem which brings noise, air pollution and blight. They feel they might be better off with something else there. Compared to the nearby Excel Centre it provides far fewer jobs or wider economic benefit. Campaigners at London City Airport are calling for a change in the way aircraft noise is measured, and more needs to be done to protect people living under noisy flight paths. The group’s chair, John Stewart, says the problem is partly down to a lack of measurement of the cumulative noise produced by flight paths from several airports (Heathrow and London City here) which both affect one area. He believes separate measurements of just each airport’s noise fail to give a true picture of the impact on residents, resulting in official statistics that underestimate aircraft noise levels. Both need to be combined in order to get a figure for the total noise in order to get an accurate assessment of the real noise levels experienced by residents. John said: “In the areas of east and south east London, where people get planes from both London City and Heathrow, noise levels will be a lot higher than official statistics show.” The concerns remain despite mayor of London Boris Johnson’s blocking of London City Airport’s proposed expansion. HACAN East says the Greater London Assembly backed cumulative noise readings, from both airports combined, two years ago, and that the airport should recognise this. It suits the aviation industry to deliberately keep the noise figures separate. Boris Johnstone, the Mayor of London, has refused London City Airport’s plan to expand on noise grounds. In a letter he has instructed Newham Council, who had approved the application, to refuse it. The Mayor says the application does not “adequately mitigate and manage its adverse noise impacts.” Newham’s decision was always dependent on the Mayor’s approval. London City Airport wanted permission to build new taxiways to permit larger planes to use the airport. It also wanted more car parking spaces. The decision will be a bitter blow to the airport as it will now no longer be able to bring in the larger planes it wanted to serve new destinations. John Stewart, chair of HACAN East, which campaigned against the expansion plans, said “The airport is paying the price for being so cavalier about noise. Quite simply, Boris did not believe its claims that it was dealing adequately with noise. We salute his decision”. The decision appears to be final, and it is unclear whether London City Airport can appeal to the Secretary of State. They may do so. London City Airport wants to press ahead with controversial plans to concentrate flight paths despite only 3% of people backing them in the recent consultation. Its consultation ended in November 2014, and the airport produced a report report on the consultation on 13th February. The report now goes to the CAA for approval. London City Airport’s consultation was widely criticized in 2014. The airport had refused to leaflet or hold meetings in the areas that would be worst affected by the new concentrated flight paths. It justified its minimal consultation on the grounds that the changes it was proposing were not significant. Despite criticism from MPs, local authorities, residents’ groups and members of the Greater London Authority, London City has defended its consultation in its report to the CAA. It is also refusing to withdraw or modify its original plans. Residents’ organisation HACAN East, which coordinated much of the opposition to the changes, believes the airport has been typically arrogant and unresponsive – and not given any consideration to the possibility of respite for various areas, at different times of day. London City Airport expresses very little concern for its neighbouring communities. HACAN East say the fight by residents will continue, and they will be pressing the CAA to order the airport to carry out a fresh consultation. Newham Council has granted planning approval London City Airport’s plans for an extended terminal, a new taxi-way and additional parking stands for larger aircraft. A new six-storey four-star hotel with up to 260 bedrooms will also be built on site. The expansion will increase the number of take-offs and landings at the airport from 70,000 a year to 111,000 and will almost double the number of passengers to 6 million a year by 2023. The number of aircraft stands will increase from 18 to 25, and the newer, larger planes they will accommodate will expand the airport’s reach from destinations in western Europe to Russia and North Africa. It has been described as a boost for London’s aviation capacity, while the arguments for and against a new runway at Heathrow or Gatwick (or neither) continue. There are claims for a large number of jobs, and Newham believes many will be for their residents – and there are claims of huge economic benefit for the local and UK economy. The expansion involves the tripling of the size of the terminal to 51,800 ft square and will see the number of flights increase from 38 to 45 during peak morning and evening rush hour times. Building work, subject to final planning approval being given by Boris, is expected to start by the end of 2015, with the first new aircraft seen on the runway in 2016. On 3rd February Newham Council will hear City Airport’s application to expand. This, despite the fact that the latest public consultation on the application only closed on 23rd January. Clearly Newham council officers are quick readers! The agenda is with the Planning Officers report, in which they recommend to grant the planning application both for the hotel and the infrastructure, can be found at http://mgov.newham.gov.uk/ieAgenda.aspx?M=10678. Flybe is suspending its Inverness to London service due to lack of demand. Flybe said it was “regrettably” stopping the service from Sunday 22 February due to “lower than anticipated” passenger numbers. But the number of flights from Edinburgh to London City will increase to 6 a day as they had “proved popular” with customers. “Overall, Flybe expects to fly at least half a million passengers annually on its routes to and from London City Airport. These services provide direct links across the UK and Ireland into the heart of London and offer a faster and cheaper alternative to road, rail and ferry travel.” And without needing more space at Heathrow, or at Gatwick. 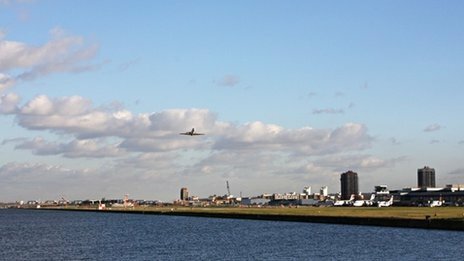 London City Airport has a public consultation on changes to its flight paths, which ends on 27th November. The consultation has been widely regarded as inadequate, as there is insufficient detail, and among those criticising the consultation are several councils. The community group representing people under London City Airport flight paths, HACAN East have published their consultation response. It says concentration of flight paths, without respite, is inequitable and will subject thousands to significantly more noise. They say this concentration without respite is contrary to Government policy, as the CAA itself states: “When seeking opportunities to provide respite for those already affected by aircraft noise it is important that decisions about respite should always be made after considering the specific local circumstances and through engagement with the local community.” HACAN East also complains that the quality of the consultation has been poor. The airport did not directly tell local authorities, MPs, GLA or local residents, and refused to hold public meetings in, or leaflet, the affected areas. They are unimpressed at the claims flight path changes would contribute much in savings of carbon emissions. There is growing anger in areas affected by London City Airport flight paths, because of the inadequate consultation they have launched – it ends on 27th November. On 3rd November, there was a packed meeting in Wanstead, which called on the airport to re-consult. Over 200 people crammed into Wanstead Library and gave London City Airport a very tough time over its failure to consult local people, and even their local councillors, over its plans. The airport wants to concentrate departing flights in a narrow band over Bow, Leyton, Leytonstone, Wanstead, Collier Row and Havering. Planes arriving over South London will also be concentrated. Most councillors knew nothing about the plans until contacted by HACAN East. The plans are on the airport website, but the airport has not put out leaflets or held any public information sessions. Roger Evans, the GLA member for Redbridge and Havering said, “The decent thing to do is to re-run this consultation.” The CAA has been criticised for allowing this poor consultation. People have been encouraged to write to the CAA and the Government calling for a fresh consultation, and sign a petition against concentrated flight paths. London City Airport has a current consultation on the use of high-tech satellite navigations (RNAV) in planes, which would result in a narrower flightpath over Wansted, Leytonstone, Leyton and Barking. Under the plans, most planes travelling to and from the airport would use a ‘flight corridor’ over Waltham Forest and Redbridge, leading to concerns over noise disturbance. Campaign Group HACAN East called on the CAA to stop the process, which it says has not directly consulted people living in either area. Now the deputy leader of Waltham Forest council has written to the head of City Airport and urged him to contact residents. The airport is claiming there is hardly any change, as it is just that planes will follow routes more accurately. The reality is that they will be concentrated along a narrow line, at the centre of the previously wide path swathe. HACAN East is organising a public meeting on 3rd November in Wanstead, as the airport has neither leafleted affected areas, nor arranged a meeting. London City Airport is proposing to concentrate flight paths, in the same way that other airports have been doing recently. This is how air traffic controllers, NATS and the CAA want airspace to be used in future, in order to fit more aircraft into our already very crowded skies. However, London City Airport decided not go give any prior notice to anyone about the changes, except their Consultative Committee, or any warning about the substantial increase in aircraft noise for those unlucky enough to be under one of the new concentrated routes. It seems even local councils were not notified. Local community group, HACAN East, have now written an open letter to the airport, to complain. HACAN East says the flight path proposals will have a profound effect – for the worse – on the lives of tens of thousands of Londoners. This is deeply inequitable. While the airport makes out that the proposed changes are not significant as the planned flight paths are not noticeably different from the current routes. That is incorrect. There is now a concentrated line. Thousands living in Bow, Leytonstone, Wansted, Catford, Brixton and Vauxhall are very well aware there is a significant change. And that these are seen as unfair. London City Airport are conducting a consultation on airspace changes, which started on 4th September. It ends on 27th November. It aims to concentrate flight paths, in line with the intentions of UK air traffic control service, NATS. Concentrating flights along narrow corridors is more efficient for air traffic control. Instead of a swathe of perhaps 2 miles wide along which planes are directed, they can now follow a 100 metre track. This means fewer people in total are overflown; but for those unlucky enough to live under the new concentrated route, the noise can be deeply unpleasant. London City airport chose not to give any warning about the changes to local councils or local residents. It is not leafleting any areas, nor holding public meetings to explain the proposals. The areas particularly affected are Bow, Leytonstone, Wanstead, Colliers Row, Dagenham, Hornchurch, Catford, Dulwich, Brixton, Stockwell and Vauxhall. It is deeply inequitable. Local campaign group, HACAN East, will be holding a public meeting. They also have a simple template letter people can send in, to express their views. The lengthy consultation document is hard for laypeople to clearly understand. The CEO of London City Airport, Declan Collier, has said that because so many groups are consulted during the planning process in the UK, it takes twice as long to get a decision than it does in Europe. He said: “We are all frustrated by the delays. In the UK, the problem is that the planning system is too democratic, it takes too long to consult and to make a decision.” Mr Collier is paid to make the most profit he can for his airport, and so he promotes the usual opinions about allegedly huge costs to the UK if it delays building more runways etc. The aviation industry has never been shy about making extravagant claims about the supposed benefits it brings the country, while being coy about the difference between profits for the industry, and benefits to the UK as a whole. On the democracy issue, in December 2013 David Cameron said: “It is frustrating sometimes that we can’t do things faster in Britain but we have a planning system, we have democratic accountability for that planning system, we have a need for everyone to have their say and make their point. That’s very important in the British system.” In a country as crowded as the south of England, planning decisions need to be democratic, and to be seen to be so. Campaign group HACAN East has written to the Civil Aviation Authority (CAA) to ask it to suspend the current consultation being carried out by London City Airport into flight path changes in East London. HACAN East argues that the tens of thousands of residents who are in line to get more planes over-head if the flight path changes go ahead are not being told about them. London City is proposing to concentrate the flights taking off from the airport in a narrow corridor, but its location is not being made clear enough. Areas directly under the favoured flight path will be Bow, Hackney Wick, Leyton Midland Road, Leytonstone, Barkingside and Colliers Row – but the airport is not leafleting these areas. People will just not realise the full impact till it is too late. New computer technology can now guide aircraft much more accurately [like satnav for planes, enabling an aircraft to fly a very exact route] when landing and taking off. It gives airports the option of varying the routes the planes use in order to give all residents some respite from the noise or of concentrating all the planes on one route. London City has chosen to concentrate the aircraft. London City Airport have started a consultation on airspace changes (4th September to 27th November) as it wishes to alter flight paths. The change will be because instead of less accurate navigation by aircraft, they now can fly using a very accurate form of satnav for planes. This is referred to as RNAV, meaning precision navigation, by which aircraft can all fly a course accurate to within a few hundred metres. The effect is concentration of flight paths, so most fly the exact same route, and anyone living under that route gets all the planes, and all the noise. Campaign group HACAN East has accused London City Airport of failing to spell out to tens of thousands of residents in East London that they are in line to get many more planes overhead if proposed flight path changes go ahead. The consultation does not make this clear. Areas directly under the favored flight path – and the concentration -will be Bow, Hackney Wick, Leyton Midland Road, Leytonstone, Barkingside and Colliers Row. The effect will be to create a noise ghetto. Air traffic controllers like concentration of flight paths. However, it is often better – less unfair – to share out the noise burden, so many people get some flights, rather than a few getting them all. There will be a protest against the expansion of London City Airport. Newham Council will soon decide whether it should expand. A group of local campaigners, working with the affected local community, plans to protest – to show the airport that whatever the Council’s decision – there will be uproar if they try to expand. If Newham Council allow the airport to expand it will mean more air pollution, more noise pollution and more road traffic – especially for the communities who live around the airport – who are some of London’s most vulnerable. It will also mean that people will lose their homes to allow for the airport’s expansion. Campaigners against London City Airport expansion fear years of night time disruption if a planning application is approved. The group “Stop City Airport” say long-suffering residents in the area are already facing increased noise issues due to Crossrail works and from the proposed Chinese business park by ABP (Associated British Ports). Stop City Airport raised its latest concerns after a letter from Newham Council was made public, expressing fears over night-time construction work. Campaigner Alan Haughton said: “There will be no relief for residents. Aircraft noise all day long and as soon as that finishes, non-stop piling for three years at least.” The council’s senior development manager Chris Gascoigne said the airport was proposing a construction programme lasting up to 7 years, with 3 of those being 24 hours a day. He commented: “In our view the proposed night time construction noise impacts are not acceptable and represent a potential reason for refusal of planning permission.” The airport has been asked if it can reduce operation hours, to do construction during the day, but council officers have yet to get a reply. The airport’s plans include 7 new aircraft parking stands, a 3-storey passenger pier, noise barriers and a 260-bedroom hotel. Flybe is to offer more flights from London City Airport – from October – after signing a 5-year deal. There will be routes to and from Edinburgh, Belfast, Dublin, Inverness and Exeter. Flybe hopes these will carry about 500,000 passengers a year. Exeter-based Flybe is seeking to revive its fortunes after losses forced it to shrink its operations, close regional bases and cut hundreds of jobs. It also sold 25 pairs of arrival and departure slots at Gatwick to Easyjet for £20m. In its last set of financial results, Flybe reported pre-tax profits of £13.8m for the 6 months to 30 September, compared with a loss of £1.6m a year earlier. Earlier this year, the airline raised £150m to help fund expansion. Flybe currently operates 171 routes in 16 countries. It will also introduce to services to European ski resorts from London City airport (vital business links?? ), as well as to destinations in France and northern Spain. 20 Jun 2013 Start-up airline Odyssey Airlines has confirmed an order for 10 Bombardier aircraft to operate all business-class services from London City airport. The UK-based airline confirmed the order for the 10 CS100 aircraft, which was first placed two years ago, at the Paris Air Show this week. The order is worth $628 million at list prices. Odyssey plans to offer all business-class flights from London City to New York as well as to European cities. Adam Scott, CEO of Odyssey Airlines, said: “We have a unique strategy that will offer a premier service with a focus on new destinations that cannot currently be served from London City airport.” Odyssey has not given any further details about which routes it plans to operate and also what the timescale is for the launch of flights. The CS100 aircraft has capacity of up to 110 seats and is due to make its maiden flight in the next few weeks. Click here to view full story …. 8.11.2012 A £15 million expansion programme announced by London City Airport to mark its 25th anniversary has been criticised by campaigners over the increasing number of flights—double the restrictions imposed when it first opened. London City Airport is to submit a planning application shortly for more infrastructure to allow for expansion and for medium haul flights. But the expansion year-on-year goes against the original planning when the airport was opened on November 5, 1987. Only 4 airlines operated from the airport in 1987, with flights to just 3 destinations—Plymouth, Paris and Brussels. Today, 25 years on, 10 airlines fly to 42 destinations across the UK and Europe, as well as twice-a-day to New York. Hacan East, which represents families living under the flight paths across east London, has accused airport bosses of broken promises. The government inspector at the original airport public inquiry in the 1980s restricted aircraft to quiet turbo-props rather than the jets that proliferate today, and flights limited to 30,000 a year. Private jet business travel. Who uses it and why? May 13, 2012 In a long article on who is using private business travel, and why, ABTN gives a lot of information on how the industry works. Private flying has fallen significantly since 2008 and the financial crisis. The banking sector used to use more business jets when they launched new IPOs (initial public offerings) when executives wanted to make many presentations in different places, the same day. They also say companies want the private space on the plane to continue their discussions, as well as the very fast transfer from car to plane, and plane to car, with the minimum of hassle. Rock bands etc, now make a higher proportion of their money from tours, so they like using private jets for painless travel. And the remote locations where some natural resources and minerals are found are more quickly accessed by private flights to small airports, rather than large planes to main airports. And more …. Click here to view full story… And while London City Airport had 15,000 business jets in 2007, it was down to 7,000 in 2011 and may be around 7,500 in 2012. Are environmental safeguards for London City Airport strong enough? London Assembly opposes any increase in flights at BAA’s London airports. levels as part of a project set up by Fight the Flights in alliance with UCL. existing nuisance from overflights experienced by residents in many boroughs. Economic benefit must be balanced against the problems it causes. with complaints from residents since the introduction of the new flight path. undelivered. These were meant for the passengers on the final flight to Copenhagen. normally given where the Court recognises the public importance of the case. government’s policy to reduce aviation emissions to below 2005 levels by 2050. 15.08.09 £540 for 2 weeks – airport parking! to increase the number of flights over east London from London City Airport. accommodate nearly 50,000 extra flights per year after the project is complete. Embraer jets later this year. The managing director said: “It will be a big benefit. private jet flights at London City airport by locking themselves to an aircraft. clamp around one of the airport’s business jet fleet at the west end of the runway. more CO2 per passenger than commercial flights. 10.6.2009 More …..
activists feel in getting their voices, and concerns heard on aviation expansion. as police investigated poisonous fumes possibly coming from the ladies’ loos. Belgian-based VLM has ended services between Manchester and London City Airport. 13th February 2009 A BA jet from Amsterdam has been involved in an incident at London City Airport.